We went all out on this Ultimate Sour Cream Coffee Cake. 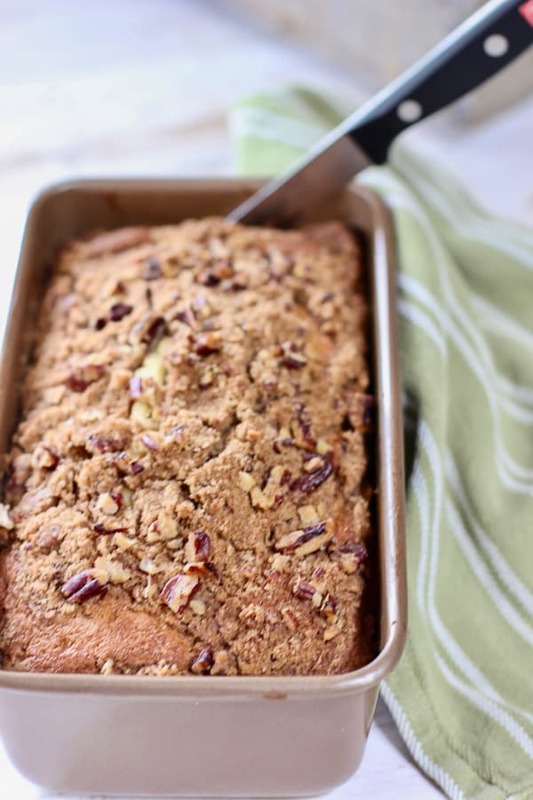 Big flavor with tons of streusel topping, all baked into a loaf shape for easy slicing! They are back! Like an old childhood friend, coffee cakes have returned and ours is the Ultimate ! We kicked this up a notch by adding sour cream and lots and lots of crunchy streusel. You can never have enough topping or crunch! I first posted this several years ago and wasn’t sure how y’all would feel about it. But with over 200,000 repins on Pinterest...I’m thinking you like it! After remaking this recipe I was reminded how much I loved it. So much so, that I had to wrap up half and bring to a skinny friend. So happy I can be of service….sharing the chub, one friend at a time. 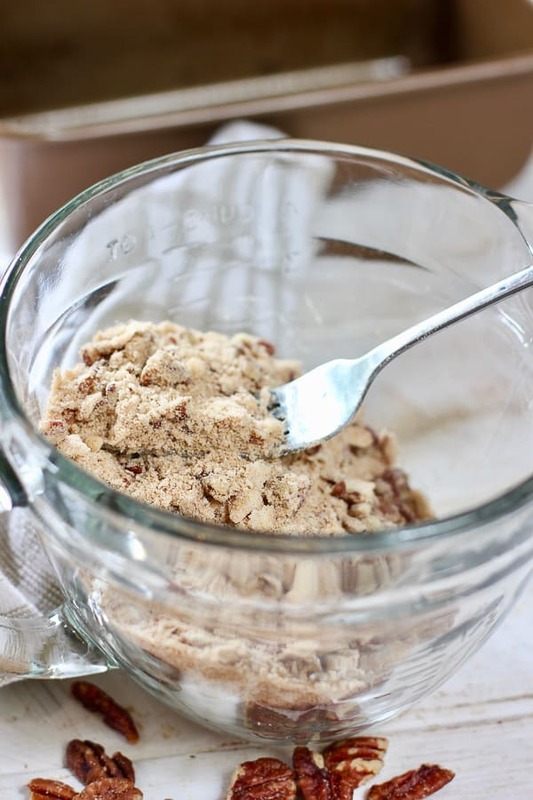 First we start by making this simple streusel topping. 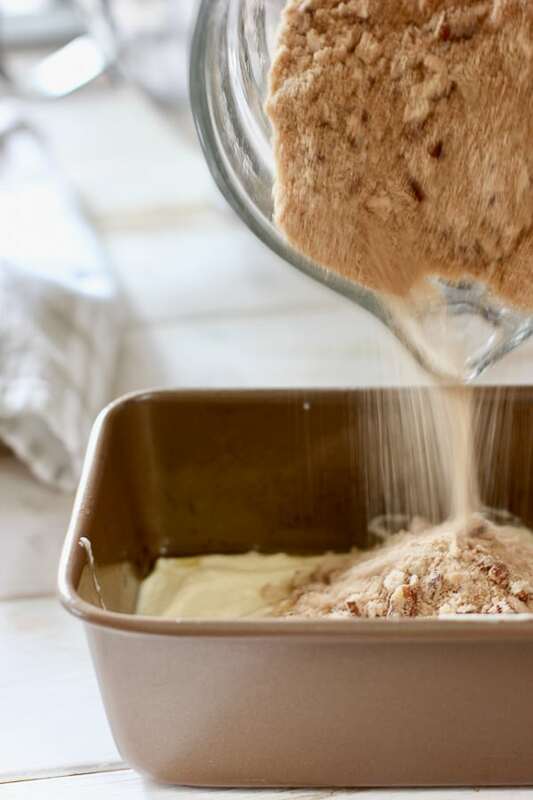 Brown sugar, nuts and cinnamon are a few of the ingredients you probably already have in your cupboard. We used pecans but walnuts or almonds would be a great substitute. An easy to make pound cake batter holds onto all that topping your about to dump into it and on it! After baking and cooling a bit, run a knife around the edges to help it pop right out of the pan. Now mix up your simple glaze and drizzle over the cooled cake. TIP: I use a fork for drizzling..it keeps the drizzle in nice lines without the globs a spoonful can make. These freeze really well and make great gifts! Who wouldn’t want a cake? We love cake! I mean really really love cake…and you can see all of ours HERE! Two of our favorites are this Peanut Butter and Chocolate Cake where you slather on peanut butter right outta the jar and top with an easy ganache frosting! or this Fresh Key Lime Cake! This super easy cake is great when you want a fresh bright flavor. 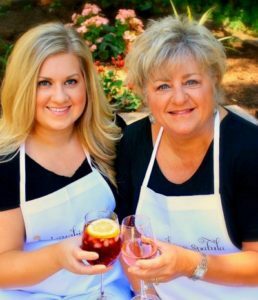 To cake…we love ya old and we love ya new! 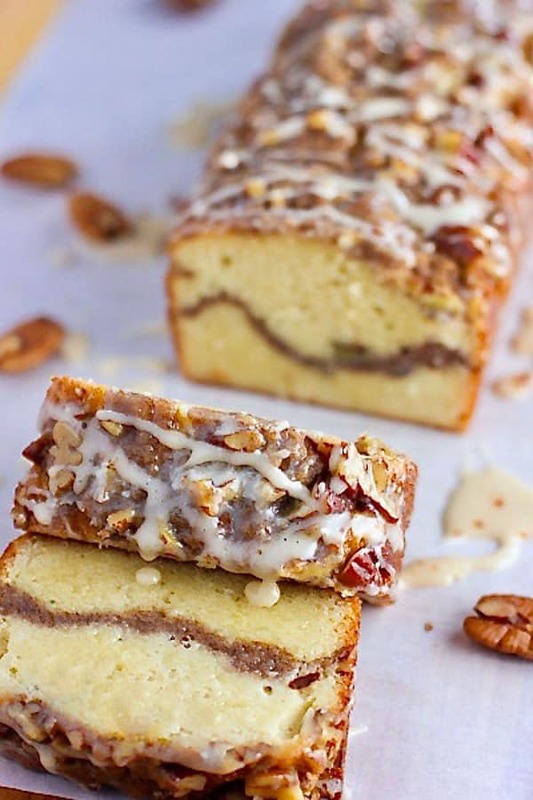 Ultimate Sour Cream Coffee Cake! 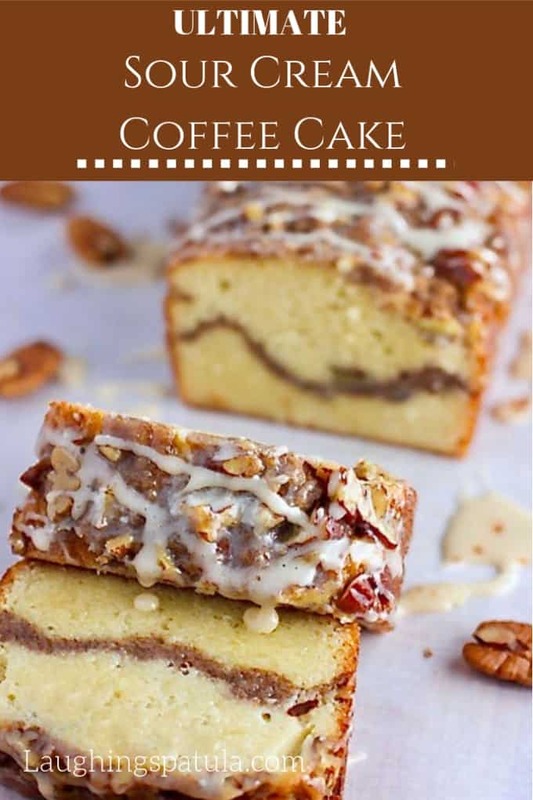 The ultimate delicious sour cream coffee cake! Preheat oven to 350. Spray 9 x 5 loaf pan with non stick spray. In separate bowl - combine flour, baking powder, baking soda and salt. Bake for about 50-60 minutes or until a toothpick comes out clean. Cool and run a knife around the edges before removing from the pan. We used pecans but walnuts or almonds would work just as well. We used a loaf pan but a 9 x 9 will work just as well. If you want 2 loaves or a 9 x 13 size cake pan - just double the ingredients and it will work fine. Hover over the serving size in the recipe card and a slider will pop up. You can adjust your recipe any way you like it! Yay technology! Can’t have nuts, can I leave them out of the streusel topping. Can you have oats? Sub oatmeal for the nuts. Whole oats would be better but could probably use quick cooking in a pinch. NOTE: I haven’t tried this but got a feeling it would work! Do you think it would keep in the mail? I have some cute paper loaf pans and want to send some to a friend. Tastes amazing but do not bake in glass or account for. 15 minutes more baking. I plan to bake mini loafs for co workers for Christmas it’s a very tasty moist cake. I made this on Sunday, not really thinking much about it because my husband loves everything sweet. After making it I tried a piece and I am hooked! This is a keeper recipe. Hi, looks delicious! What size loaf pan? Hi Leah – Just a standard 9 x 5. I’ll update the recipe! 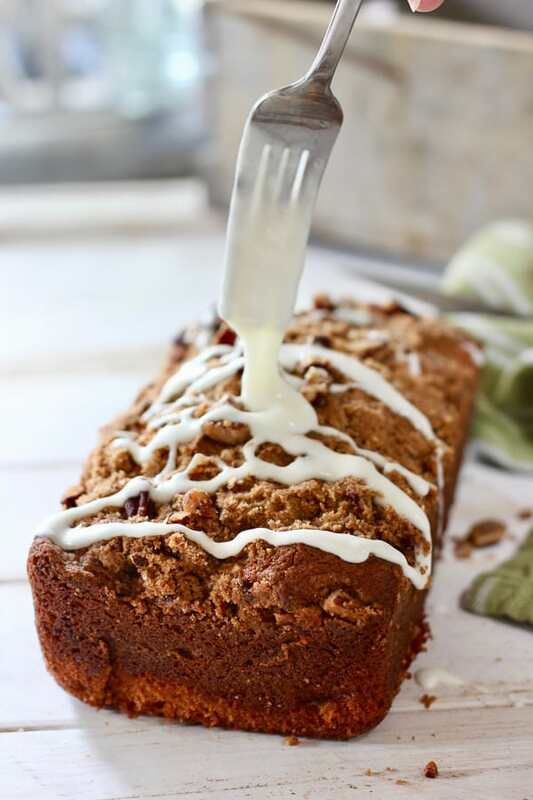 Oh my goodness, Coffee Cake looks delicious! I’m definitely making this! thanks for sharing! yep!! Sometimes I just crave pure decadence!! Butter, sugar and full fat dairy just have to make their way into my belly every now and then and this looks amazing! 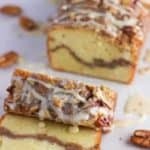 What a beautiful coffee cake, and I particularly love the idea of the maple icing, something you don’t always see in cakes like this. I’ want some right now!